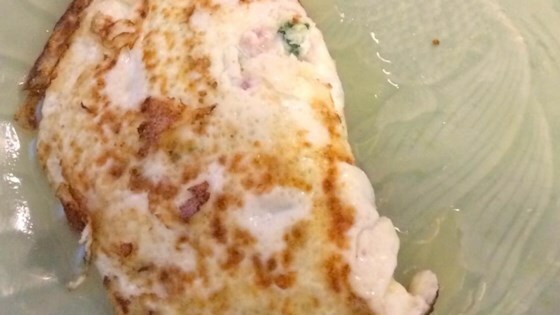 "Simple omelet using egg whites to make this suitable for a diabetic diet and for a low FODMAP diet." Whisk 1/2 cup plus 1 tablespoon egg whites together in a bowl until frothy. Heat an omelet pan over high heat; spray with cooking spray. Pour in egg whites and swirl pan until eggs run to the edge. Reduce heat to medium-high; cook until edges are mostly solid, about 2 minutes. Tease edges from pan using a spatula. Let liquid egg whites run under the cooked edges. Use the spatula to keep the omelet sliding freely around the pan. Place ham and spinach onto the omelet and sprinkle Monterey Jack cheese on top. Sprinkle red pepper flakes, tarragon, oregano, and sage over the cheese. Cook until egg whites are set on the surface and the omelet slides freely in the pan, about 3 minutes more. Tilt the pan over a plate and fold the omelet in half as it slides onto the plate. A small (8- to 9-inch) skillet can be substituted for the omelet pan. Use a nylon or soft silicone spatula (the kind for scraping the last bits of food from a jar, not a flat flipping spatula).